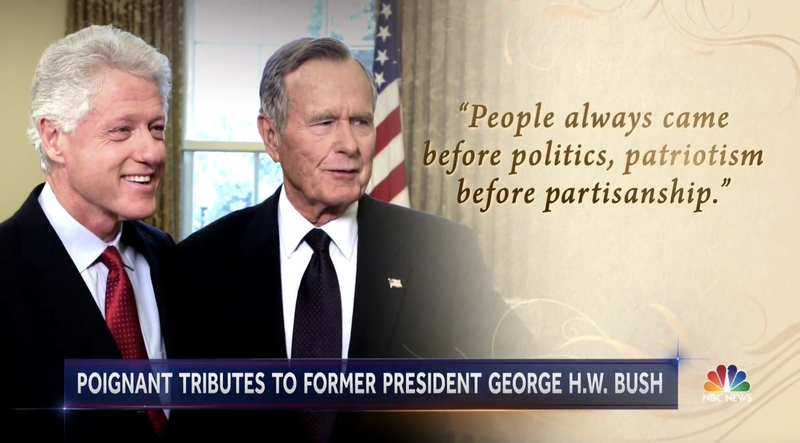 With the death of former President George H.W. Bush coming on Saturday, Dec. 1, networks scrambled to cover the news. 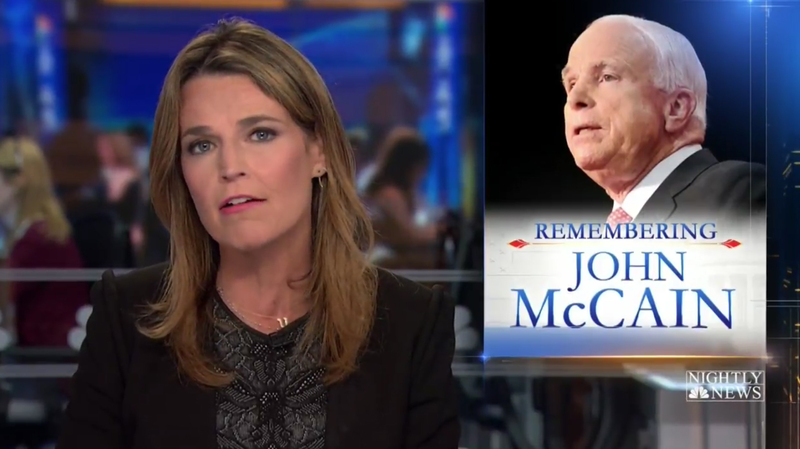 It’s worth noting that “NBC Nightly News” was the only network newscast scheduled to air at its normal time Saturday, with “ABC World News Tonight” off the schedule due to football coverage and “CBS Weekend News” (the weekend counterpart to “Evening News”) pushed to the 7:30 p.m. timeslot. 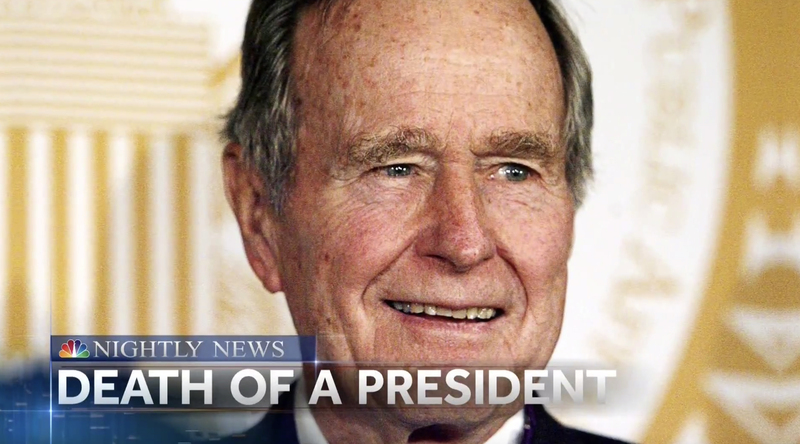 ‘NBC Nightly News’ used numerous archival photos of former President George H.W. 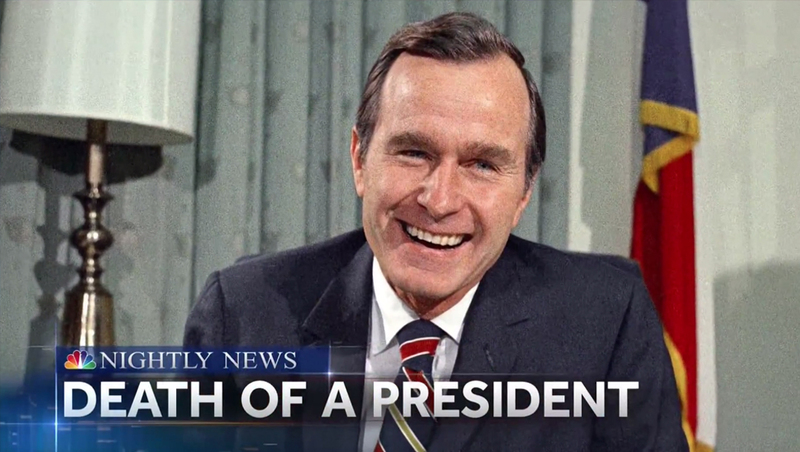 Bush under the banner ‘death of a president’ in its teases. Weekday anchor Lester Holt was brought in to anchor in place of normal Saturday anchor weekday Telemundo anchor Jose Diaz-Balart. 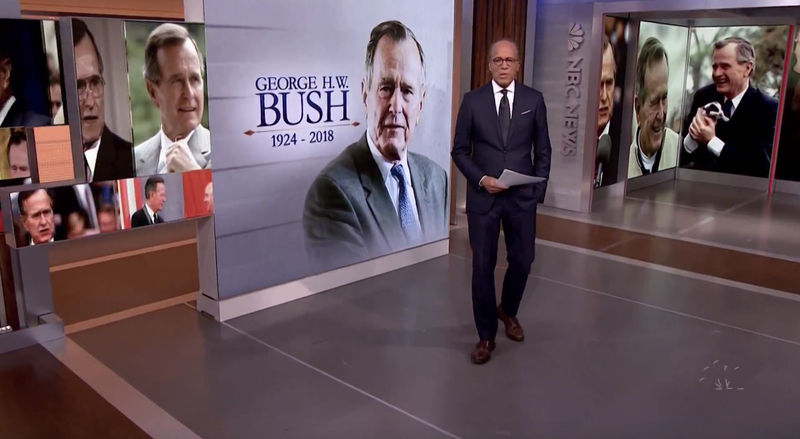 Anchor Lester Holt kicked off the broadcast from in front of Studio 3A’s video tower, which was sporting a cutout image of Bush along with the ‘double arrow’ accent and blue, sans serif typeface that it previously used to cover the death of Sen. John McCain, which also broke on a Saturday. 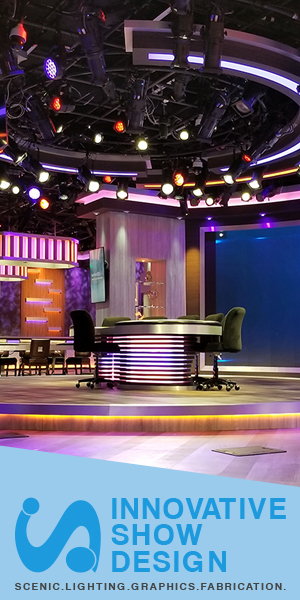 The studios ‘jigsaw’ LED panels and ‘vista’ video wall alcove were also decked out with images of Bush. Numerous tributes to Bush were also shown on screen against a light tan background with filagree accents, also borrowed from McCain coverage. Holt also appeared on screen with an OTS that dropped the network’s normal titles’ typography in favor of the the blue serif typeface. 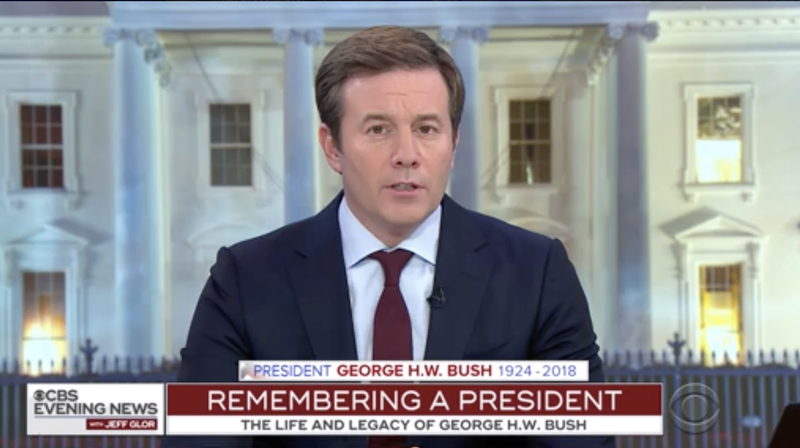 CBS aired a special edition of ‘CBS Evening News‘ on CBSN, with weekday anchor Jeff Glor at the anchor desk. The show was carried under the ‘Evening News’ name — rather than the ‘Weekend News’ branding normally used Saturday and Sunday. 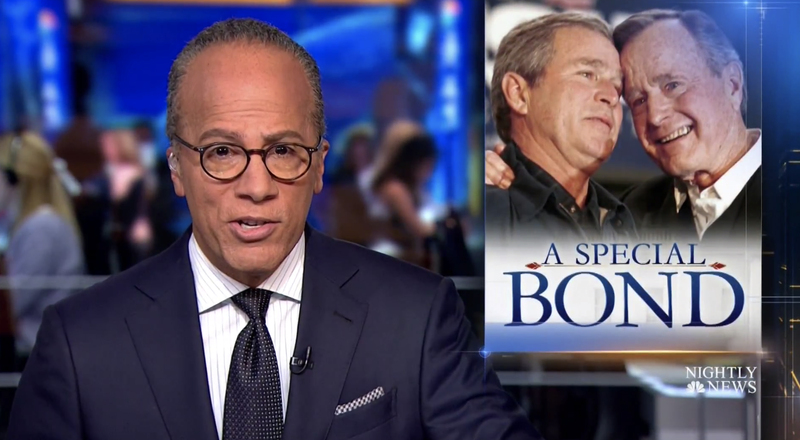 The broadcast also added a branded graphic with Bush’s name and milestone years above its normal lower thirds.